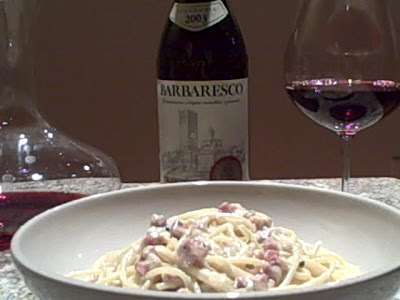 Great informative video of the Barbaresco. Sorry to hear that the wine was a bit young. Better luck next time Brian. However, I don't what you had the wine with, I'm guess Pasta as pictured above. Good choice. Brian - any chance of getting the recipe for that dish? My wife and I cook with truffles and truffle oils throughout the year and are always looking for new things to combine them with. I loved the new blog. Best of success! I love the blog Brian- well done as usual!!! Cube two thick-cut slices of pancetta and sauté in a bit of olive oil on medium or medium-low heat. When almost done, drain most, but not all, of the fat, and sauté 1 medium shallot. Add one minced clove of garlic, lightly season, and cook until just shy of golden. Add I cup of heavy cream, turn down the heat, and simmer for 15 – 20 minutes. Boil pasta, reserving some of the cooking water when done. While the pasta is cooking, grate Fontina cheese to taste into the cream sauce and stir until it melts. Just before you drain the pasta, add truffle oil to the cream sauce to taste. Be careful here: truffle oil can overwhelm all the other flavors quickly, so don’t use too much. Add pasta to the pan, toss with the sauce, thin it out as needed with the reserved pasta water, and enjoy.